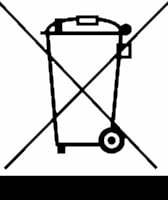 This symbol is known as the ‘Crossed out Wheelie Bin Symbol’. When this symbol is marked on a product or packaging, it means that the product should not be disposed of with your general household waste. Only discard electrical/electronic items in separate collection schemes, which cater for the recovery and recycling of materials contained within. Your co-operation is vital to ensure the success of these schemes and for the protection of the environment. www.recycle-more.co.uk is a website showing the location of disposal sites including those which are Council controlled where WEEE can be taken to ensure safe storage and recycling. Electrical and Electronic Equipment(EEE) waste is increasing three times faster than average municipal waste and the EU estimates that WEEE currently accounts for 4% of total waste. Much of the UK’s electronic waste ends up in landfill sites where toxins put communities at risk. Failure to segregate any type of recyclable material in the home will usually result in items being disposed of in a landfill site and eventually being buried in the ground or being incinerated. It has been estimated that landfill space in the UK will run out within the next 10 years and recycling WEEE will have significant effects on the environment. When WEEE is not recycled the waste can have negative impacts on soil, air and water quality that can lead to environmental damage which can also bring about negative impacts on human and animal health. a. the requirement on each Member State under Article 2 of the Directive to minimise the disposal of WEEE as unsorted municipal waste and to achieve a high level of collection of WEEE for treatment, recovery and environmentally sound disposal; b. the collection and take back systems available to them; c. their role in contributing to the reuse, recycling and other forms of recovery of WEEE under these Regulations; d. the potential effects on the environment and human health as a result of the presence of hazardous substances in EEE; and e. the meaning of the crossed out wheeled bin symbol. WEEE Regulations as Applicable to Inwood (Cymru) Ltd.
Inwood (Cymru) Ltd are only obliged to take-back items that are used for domestic/household purposes on a like for like basis when the buy a new Electrical or Electronic product from us. We are not obliged to accept any items used for commercial purposes. Inwood (Cymru) Ltd is not responsible for the cost of collecting any items from domestic premises and these are returned to us at your own cost. (a) is of equivalent type to, and (b) has fulfilled the same function as, the supplied equipment. 34.-(1) As a retailer to whom the obligation in regulation 31 applies we shall maintain records of the number of units of WEEE from private households returned to us under that regulation. (2) A retailer who returns WEEE from private households under regulation 32 shall maintain records of the number of units of WEEE from private households returned by him under that regulation. (3) Each retailer to whom the obligation in regulation 33 applies shall maintain records of the information made available under that regulation. 25 (4) The records referred to in this regulation shall be kept for a period of at least four years commencing on the date on which any such record is made and shall be made available to the Secretary of State on demand. The requirements of regulation 31 (to “ensure that WEEE from private households can be returned on a one-to-one basis”) and regulation 34(1) (maintenance of records). We offer the opportunity to have your electronic items returned to us for safe disposal under the WEEE regulations. These items will be recycled or disposed of responsibly.